AMFI Spec-Grade™ Rain and concretetight EMT compression coupling with a trade size of 2-inches, provides compression connection for tight fitting. This coupling in zinc-plated finish, has screw machined steel construction for strength and durability. The coupling measures 3.375-Inch x 2.938-Inch and utilizes two sealing rings to prevent water seepage. This compression coupling is suitable for use in wet location to ground and secure EMT raceway boxes and enclosures together. 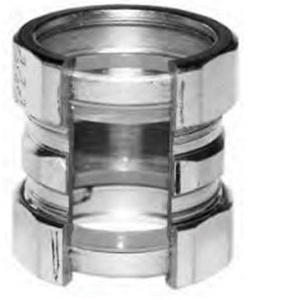 EMT compression coupling is cULus E101868 listed.